Research included in the April Update to the 2018 edition of IC Insights’ McClean Report shows that the world’s leading semiconductor suppliers significantly increased their marketshare over the past decade. The top-5 semiconductor suppliers accounted for 43% of the world’s semiconductor sales in 2017, an increase of 10 percentage points from 10 years earlier (Figure 1). In total, the 2017 top-50 suppliers represented 88% of the total $444.7 billion worldwide semiconductor market last year, up 12 percentage points from the 76% share the top 50 companies held in 2007. 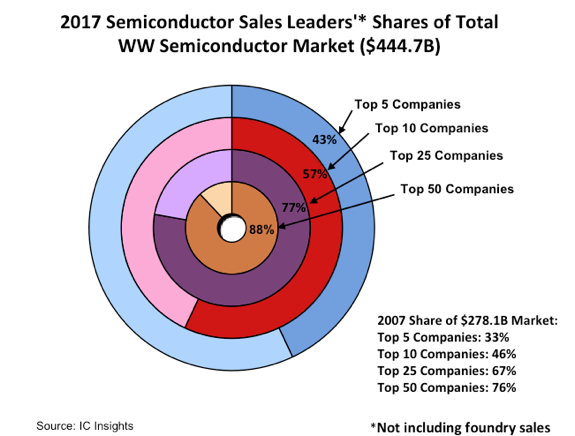 As shown, the top 5, top 10, and top 25 companies’ share of the 2017 worldwide semiconductor market each increased from 10-12 percentage points over the past decade. With the surge in mergers and acquisitions expected to continue over the next few years (e.g., Qualcomm and NXP), IC Insights believes that consolidation will raise the shares of the top suppliers to even loftier levels. 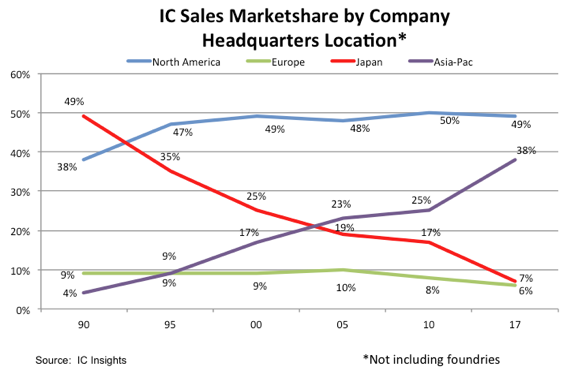 As shown in Figure 2, Japan’s total presence and influence in the IC marketplace has waned significantly since 1990, with its IC marketshare (not including foundries) residing at only 7% in 2017. Once-prominent Japanese names missing from the top IC suppliers list are NEC, Hitachi, Mitsubishi, and Matsushita. Competitive pressures from South Korean IC suppliers—especially in the memory market—have certainly played a significant role in changing the look of the IC marketshare figures over the past 27 years. Moreover, depending on the outcome of the sale of Toshiba’s NAND flash division, the Japanese-companies’ share of the IC market could fall even further from its already low level. With strong competition reducing the number of Japanese IC suppliers, the loss of its vertically integrated businesses, missing out on supplying ICs for several high-volume end-use applications, and its collective shift toward the fab-lite IC business model, Japan has greatly reduced its investment in new semiconductor wafer fabs and equipment. In fact, Japanese companies accounted for only 5% of total semiconductor industry capital expenditures in 2017 (two points less than the share of the IC market they held last year), a long way from the 51% share of spending they represented in 1990.